I’ll just start out by saying- it’s shameful indeed when a recipe calls for canned tomatoes (canned anything if you ask me) unless you live at a South Pole research station or in an underground shelter, you can just as easily pick up fresh ingredients at the store as a can off the grocery story shelf, don’t be lazy folks. 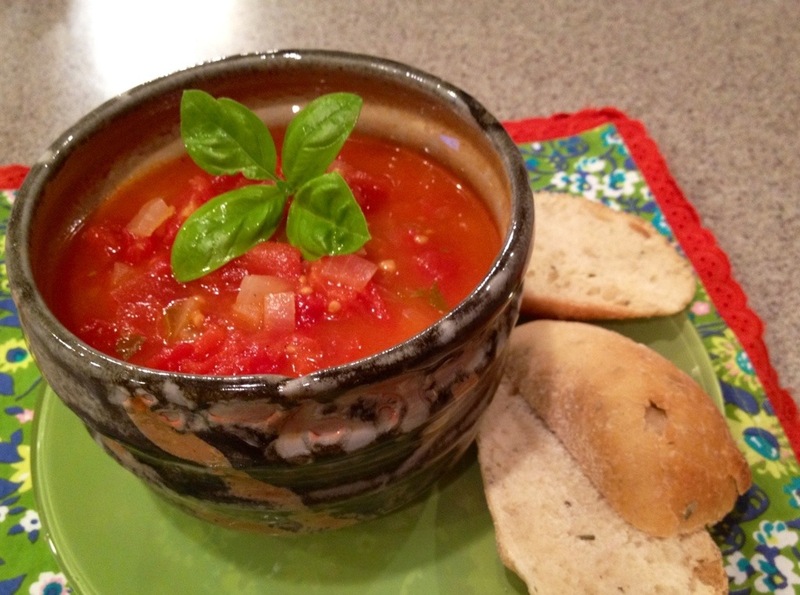 The reason this soup is so delicious is because it’s made with real, and best case scenario- homegrown tomatoes. So, if you’re thinking about using canned tomatoes here, then you may as well just grab a can of Campbell’s tomato soup instead. That said (I hope I haven’t made anyone cry, like you people at the South Pole) and as a fresh food/gardening advocate, here’s my use for those bulging, juicy, oh-so-good-for-you fresh tomatoes ripening in your garden as we speak. Chop the onion into small pieces then place into a large pot with the butter, cook on medium-high heat until onion is tender. Blanch tomatoes (instructions below) and chop. Add tomatoes, chicken broth and all other ingredients to the onions. Simmer covered for 30 minutes. Especially delicious with artisan bread or warm cornbread. This soup is great as a base- add other veggies (broccoli, cauliflower, green beans, corn, celery) cheese, chicken, tortellini or cream (for a tomato bisque). Easily freezable, fill your freezer with meal size containers you can thaw out as needed throughout the winter to prepare delicious, healthy meals in a snap. 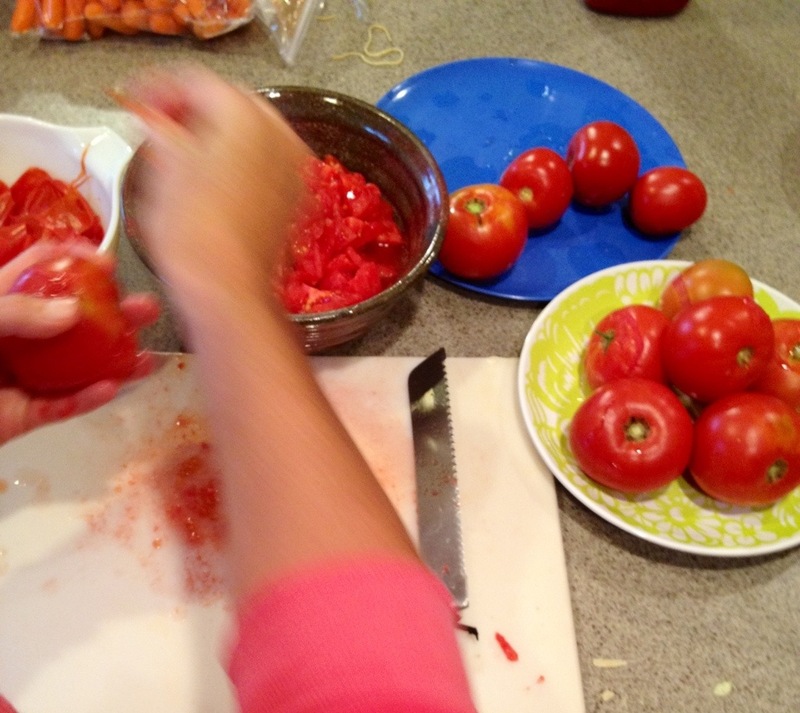 Blanching tomatoes is very easy. Fill a large pot with water and heat the water to boiling. Plop the tomatoes into the boiling water . Leave the tomatoes in for about 1 to 2 minutes until the skins start to split, then using a slotted spoon, remove them from the water and let them cool. Once cooled, peel off the loose skin and chop into pieces. 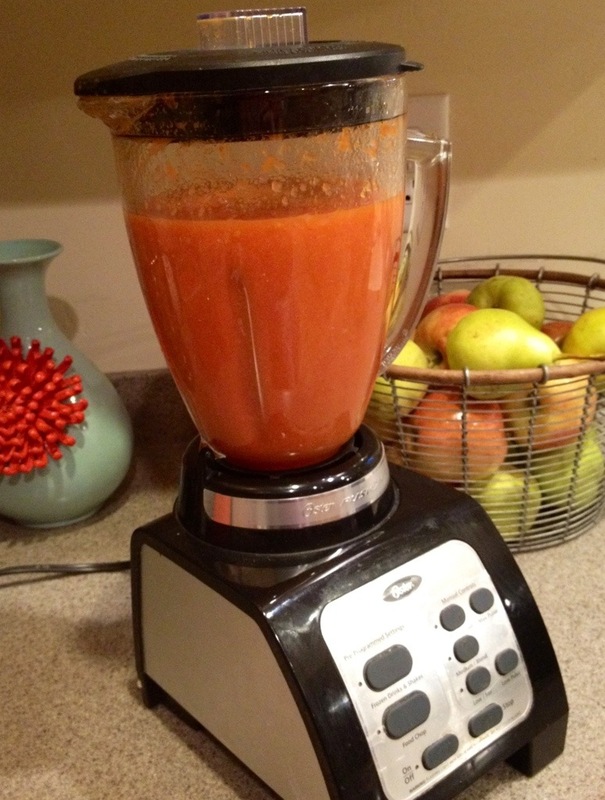 See how fast blanched tomatoes can be to work with? -the camera can’t even keep up. 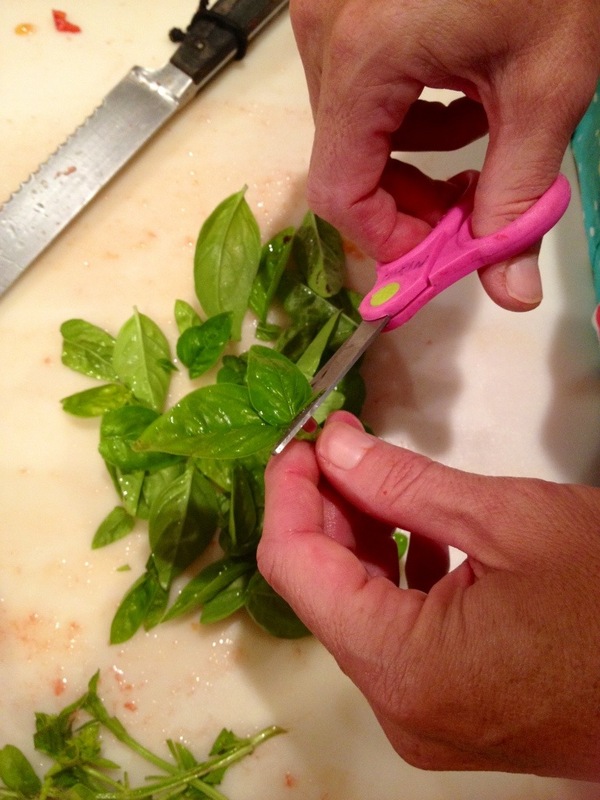 When available use fresh basil, and chop it up with fancy kitchen shears. I find using scissors to cut up basil leaves is easier than using a knife- even if the only scissor you can find are kid-sized, blunt tipped and pink. 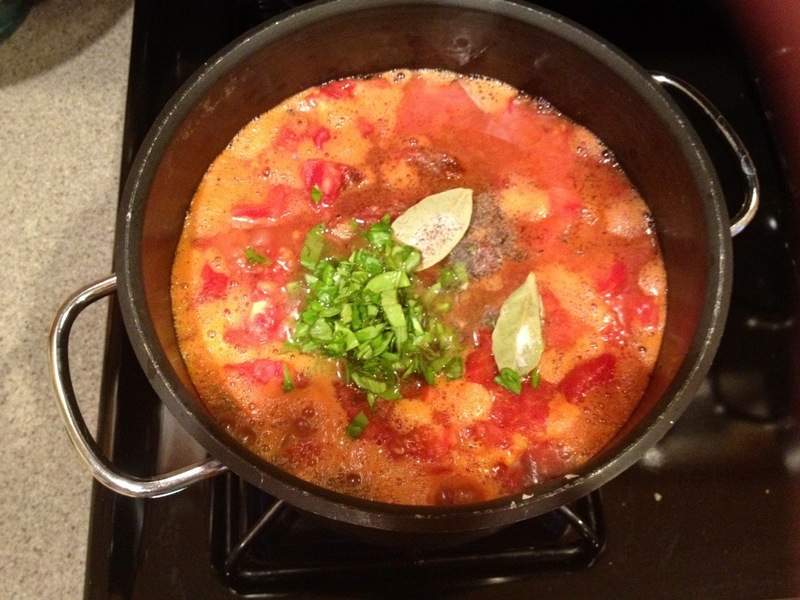 Put all the ingredients into a pot and mix well before covering it with a lid and letting simmer for 30 minutes. 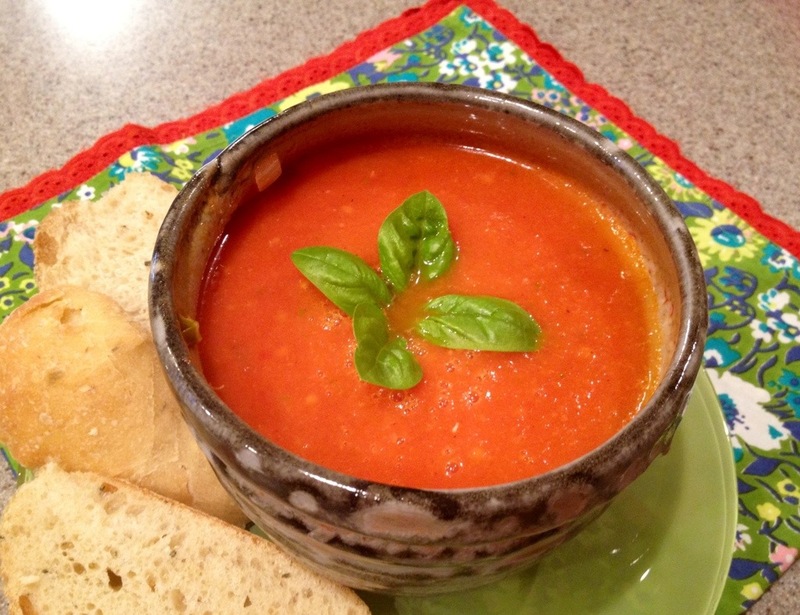 Blend it up and create a nice smooth tomato soup you can add anything to. Or just a cup full of milk or cream- like the traditional tomato soup we all ate as kids with grilled cheese sandwiches… or that we prepared yesterday, for a last minute family meal.